HARTFORD -- The 2012 legislative session chugged to a close late Wednesday in flurries of bills in the state House and Senate before the midnight adjournment hour. Lawmakers exhausted by long days of debating bills that culminated in a string of pre-dawn votes scurried throughout the Capitol for one more day to keep their legislation alive. Both the House and Senate compiled long lists of bills, each of which a week ago could have provoked prolonged debates, but in the dying hours of the General Assembly, made it onto "consent calendars" for unanimous approval without debate. 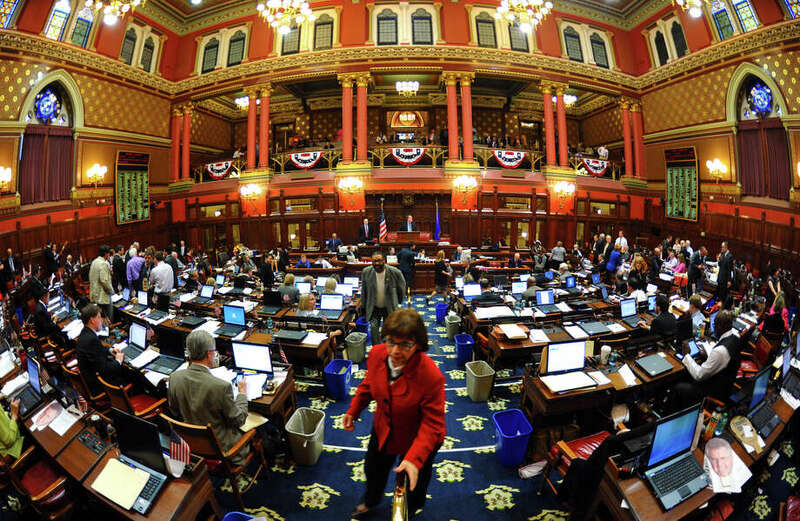 The Senate late in the evening approved legislation, in reaction to a recent court case, that would allow town and city officials to assess property taxes on buildings under construction and collect about $30 million a year. Another bill, which won final approval in the Senate late Wednesday in a 36-0 vote, would update decades-old regulations for residential hospice facilities, supported by Danbury and Stamford lawmakers. Rep. Daniel Fox, D-Stamford, said the hope is that it will pave the way for more community-based hospices for the terminally ill. Currently, the only choices are in Branford and Waterbury. Stamford's Rosenthal Hospice closed in 2011. ADJOURNMENT SCORECARD Minimum wage: The Senate failed to vote on legislation, passed by the House, increasing the state's minimum wage by 50 cents over the next two years. Severe storms: The House of Representatives and Senate passed a bill responding to last year's severe storms. Highlights include establishing performance standards for utilities. On to Malloy, who will sign it. Telecom dereg: The House and Senate did not take up a telecommunications deregulation bill the industry said would create jobs, but critics claimed would lead to layoffs, cuts in land line service and possibly allow cell towers in state parks. Tolls: The House failed to vote on a Senate bill allowing transportation officials to establish tolls to complete the long-stalled Route 11 from Colchester to I-95 in Waterford. The bill was viewed as a step toward establishing border tolls in state. Car taxes/fees: Separate proposals to equalize car taxes and change the fees for cars eligible for low-cost vintage license plates, were thoroughly dead for the session after the proponent, Rep. Jeff Berger, D-Waterbury, was dissuaded to attach them to a motor vehicle-related bill last week. Hospice care: The Senate gave final passage to a bill supporters hope will lead to the establishment of community hospice facilities in Stamford, Danbury and other areas. Currently the only locations are Branford and Waterbury. "Hopefully in the future, Stamford and other communities will have their own, so families won't have to drive to Branford or Waterbury to visit relatives in a very vulnerable stage of their lives," he said. A bill that resulted from the fatal fire last Christmas in Stamford that would require occupied homes under renovation to have smoke detectors won approval late Wednesday in the Senate. So did a bill that would extend for several years a unique financing arrangement for Bridgeport's Steel Point development. The Senate also approved final action on legislation proposed by Bridgeport lawmakers that would charge owners of blighted properties up to $250 a day for continued violation of local ordinances. Bridgeport Mayor Bill Finch, a former state senator, was in the Capitol Wednesday afternoon to encourage his city's lawmakers. "This is going to end up being a very successful session for our delegation," he said in an interview. "We applaud the governor for taking on education reform." Legislation that won final approval in the House in the early evening would give Stratford more funding options in cleaning up the hazardous waste left by Raymark Industries. Another Stratford-oriented bill would require property owners to inform prospective buyers of pending litigation or governmental agency action. Bills that won final approval head to the governor's office for review and possible signing into law over the next several weeks. Other bills, like the 50-cent hike over the next two years in the minimum wage, were just about dead, as Speaker of the House Christopher G. Donovan failed to garner enough Senate support. It took Donovan, D-Meriden until 6:30 p.m. to admit the wage hike was doomed. "I'm disappointed the Senate hasn't acted on it, but it keeps me going," said Donovan, who is seeking his party's nomination for the 5th Congressional District seat. "I'll be working in Washington D.C. for the minimum wage. It was a good bill." Retiring Sen. Edith Prague, D-Columbia, a Labor Committee co-chairwoman who spearheaded the effort in the Senate, expressed frustration with the same caucus that hours earlier gave her a sentimental farewell. "It was reduced to a quarter an hour," she said. "This is ridiculous this won't go through the Senate. I think it's a disgrace to Democrats." But the Senate's pet jobs bill, with the prestigious appellation of "Senate Bill 1" for this session, was stalled in the House and faced a possible midnight demise. The major legislation that the session will be remembered for, however, was safely tucked away. The education reforms that Gov. Dannel P. Malloy called historic, the repeal of the death penalty, next year's budget, the medical-marijuana bill and changes to campaign finance rules were well over the finish line. Going into the start of business Wednesday, the House had 174 bills on its calendar, while the Senate had 204 pending pieces of legislation, most of which were destined to die in the crush of the last day's business of the short, budget-adjustment session of the Legislature. Opponents of electronic tolls can rest easy for another year. A possible baby step toward returning tolls to the state's highways failed to come up for a vote in the House of Representatives. The Senate bill would have allowed the Department of Transportation to erect tolls along Route 11 to finance completion of that long delayed link between Colchester and I-95 in Waterford. Connecticut eliminated tolls in the late 1980s following a tractor-trailer crash in January 1983 at the Stratford booth that killed six. But over the past several years various public officials and policy groups have argued it is time to reconsider tolls for funding transportation projects. Rep. David Scribner, R-Brookfield, assured the bill would not be brought up for a vote in the House by attaching around three-dozen time-consuming amendments. Many Fairfield and Danbury-area legislators oppose tolls, although some others thought the Route 11 experiment could be used to revive the dormant Super 7 from Norwalk to Danbury. An unrelated bill that won final approval would allow for the disposition of property acquired by the state for the Route 7 corridor. Utility-centric bills were on also Wednesday's agenda. The House gave unanimous final approval to storm-response legislation that includes establishing performance standards for utilities. The bill came about as a result of the Malloy administration's reviews of the state's response to August's Tropical Storm Irene and the late-October nor'easter. Malloy's office spearheaded storm reviews that resulted in the bill and pledged in a statement to sign it. "This is probably one of the best things we've done this session," said Rep. Laura Hoydick, R-Stratford, ranking member of the Energy & Technology Committee, told her colleagues. The bill also requires state utility regulators to study the possibility of requiring electric companies to reimburse low-income customers for spoiled food and medicine. Energy Committee Co-chairman Rep. Vickie Nardello, D-Prospect, had wanted to cap the amount ratepayers contribute to an individual utility executive's salary at $350,000. But Sen. John Fonfara, D-Hartford, the other co-chairman, thought the language was anti-business and it did not make the final bill. Fonfara admitted Wednesday that one of his priorities was dead for the session: legislation deregulating the telecommunications industry for companies like AT&T. Chuck Coursey, spokesman for AT&T Connecticut, in a statement Wednesday evening said, "It's disappointing that Connecticut will continue to lag behind most other states in attracting upgraded telecom investments and jobs." "While some may talk about the urgency to grow jobs and private investment in Connecticut, when it comes to adopting the necessary policies, actions certainly don't match the rhetoric," Coursey wrote. The deregulation was defeated by a coalition of interests worried about potential job losses at AT&T, elimination of land phone lines and the possibility cellular towers would be allowed on state property, including in parks. It was also opposed by Nardello, who said Wednesday there was no evidence deregulation would have created jobs.